Texas is unique in a lot of ways, but our schools are especially unique. Here’s how. If you went to a school where immediately after the United States Pledge of Allegiance, you recited one pledging loyalty to the great flag of Texas, you definitely went to school in Texas. It’s the greatest country in the USA! Tomie dePaola’s illustrated book about the state flower of Texas is a classic in all Texas schoolrooms. It follows the story of a young Comanche girl who sacrifices her single most prized possession to the spirits to help end drought and famine in Texas. The result of her sacrifice is the beautiful Bluebonnet that now graces our great state every year. If you need a refresher on this fantastic book, you can have a listen hear. I don’t know exactly how the Mum thing started in Texas, but it’s definitely a big deal. So big in fact that there are folks who call themselves professional Mum makers in a lot of Texas towns and mum making supplies at stores all over our state. Status in High Schools in Texas is based on how big of a mum you got. It’s a fact. The bigger and crazier the better. Heck, there are some that have flashing lights and make sounds! 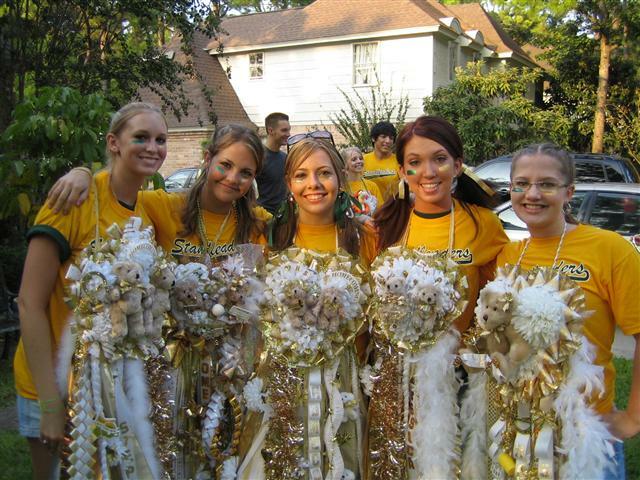 I remember the first time I found out that people in other states didn’t do the Homecoming Mum thing I was floored. I grew up assuming that everyone did it. The truth is, it’s basically just a Texas thing. In fact, there are people that have moved here from out of state and are still baffled by it. Crazy right?